The Ori Studio Suite redefines the idea of compact urban living. Gain the flexibility and versatility you need by having your space adapt to your needs. 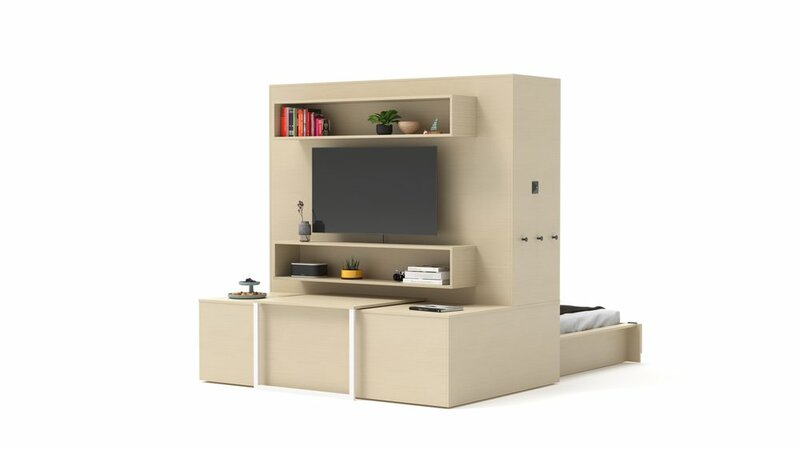 Along with providing ample storage space, the Ori Studio Suite allows you to reconfigure your space at the touch of a button, creating a cozy sleeping room when you need it, and opening up the living area when you don’t. The Ori Studio Suite simulates the functionality of multiple rooms in a single, small, efficient space. Available in full or queen size and with premium-quality finishes in walnut, oak, white and gray. Mattress, TV and accessories not included. Available in full or queen size and with premium-quality finishes in walnut, oak or white. Mattress, TV and accessories not included.